Invest in a treadmill desk, don't drink coffee, and stick to a raw food diet. I mean, God bless kale -- am I right? Truth is [...] and this is hard to hear -- performing at your best requires all of your mental energy. Every last drop. You see, it's just not compatible with something like hobbies or even having a family. With the Baozhu pulling John from 2003 to 2019, a consequence of the timeline being altered was that Sam was never pulled back into the hunting life by Dean, and went on to become a successful lawyer running a law firm. Dean wishes on a Baozhu (a magic pearl that grants what the heart desires) in the hope of ridding Michael from his mind, but instead it brings John Winchester from 2003. The disruption to the time line starts to manifest -- there is evidence that Dean is still hunting but is wanted by the FBI, and that Sam is an internet-famous corporate lawyer. Dean finds a video of Sam in glasses and a black turtleneck giving a TED Talk-style lecture in which he espouses the value of kale. Dean is most disturbed, however, by the alternate Sam saying he has no time for family in his life. When John agrees to return to his past, Sam smashes the Baozhu and John returns to 2003 where he wakes up in the Impala, thinking he had dreamed the whole thing. John's return causes the timeline to revert back to normal, erasing this version of Sam from existence. 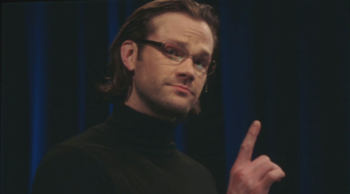 Fandom dubbed this version of Sam "TED Talk Sam."